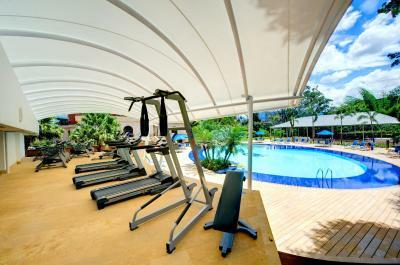 Lock in a great price for Hotel Dann Carlton Medellín – rated 8.8 by recent guests! 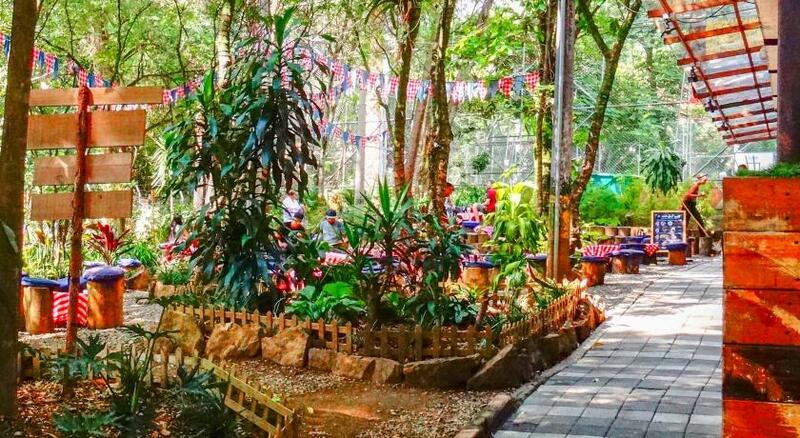 This was my second 3 week stay here. I like the facilities and location. Breakfast was very good. Pool and gym were fine. Great staff. Especially helpful were Ruben at reception, Nora in the lobby, Jorge at breakfast and the concierge Catalina. The hotel met all my needs. I will stay here again. It feels like home except as noted below. Breakfast buffet was good. I enjoyed the soup every morning, along with the other food items. The pool was beautiful. I liked that my room had a lot of outlets all over, allowing me to plug into any of them when needed. I love when rooms have plentiful outlets. 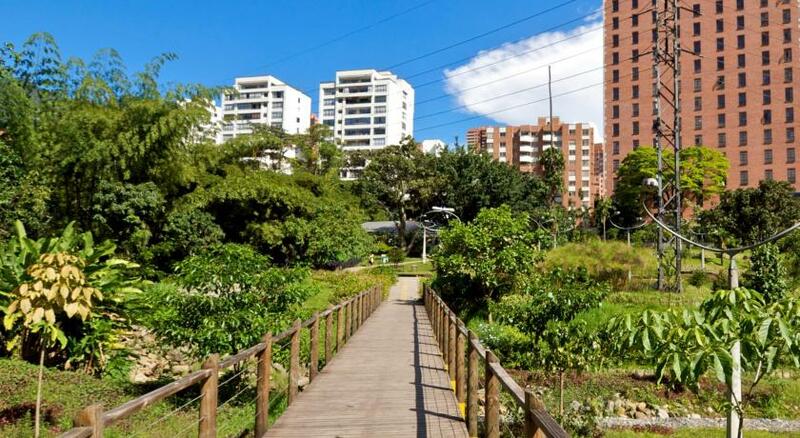 Prime location- on best neighborhood- Avoid downtown and stay on this area (poblado) safe touristy yet classy and private. 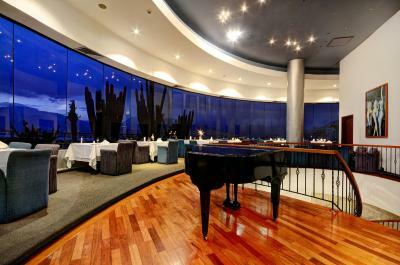 Go to the top floor for the rotating panoramic restaurant. Taxi ride back to the airport $25USD official fare. 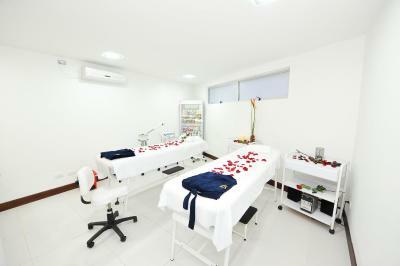 The location and the room was very clean and well furnished. The staff was very helpful and professional. Great location. View from room was great. Staff was polite and respectful and helpful. The room was very nice. The bed was very comfortable. Not big variety of breakfast items. Had to ask for washcloths & only got half the stay. Problem with price of 5th day as added on well before trip, but desk said 5th day was a different price. The facilities were not good. Mostly everything was a little old and tacky. Same breakfast buffet every morning was little boring. Beautiful hotel. Amazing staff. Awesome breakfast! 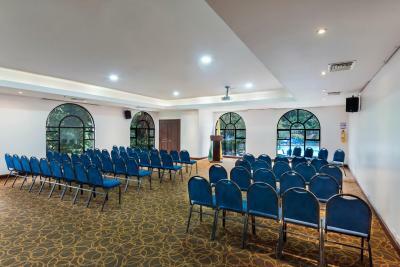 Hotel Dann Carlton Medellín This rating is a reflection of how the property compares to the industry standard when it comes to price, facilities and services available. It's based on a self-evaluation by the property. Use this rating to help choose your stay! 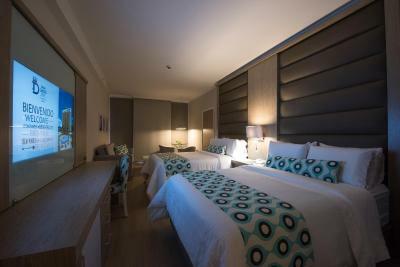 One of our top picks in Medellín.Luxurious rooms with seating area, an outdoor pool and spa are offered at Dann Carlton. 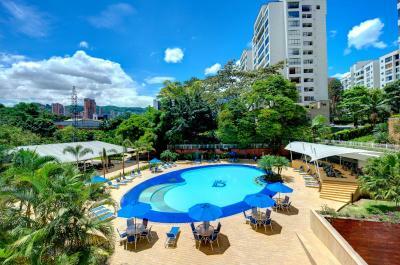 The Hotel is located in El Poblado area 3 blocks from San Fernando Casino. WiFi access is available throughout for free. 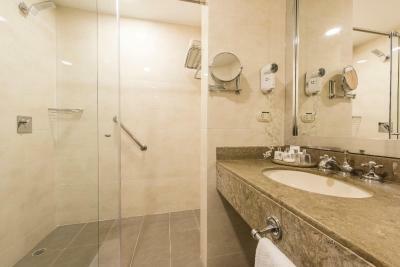 The large rooms at Hotel Dann Carlton Medellín are air conditioned and equipped with TV and mini-bar. There is a sun terrace at Dann Carlton´s pool. Guests can enjoy beauty treatments at the salon, work out in the gym or take one of the relaxing massages that are offered. Terraza Zaguán del Patio serves an extensive buffet breakfast and during the evenings candlelight dinner can be enjoyed with regional and international specialties. 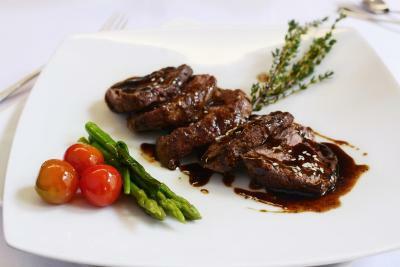 Room service is available 24/7 and airport shuttle service is offered for a surcharge. 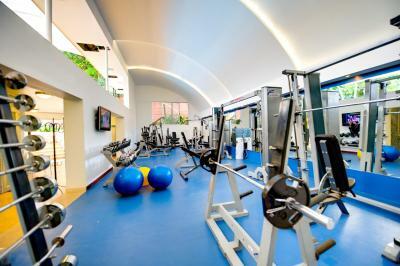 The Hotel is located a 30-minute drive from Jose Maria Cordoba Airport. Free private parking is possible at Dann Carlton Medellín. 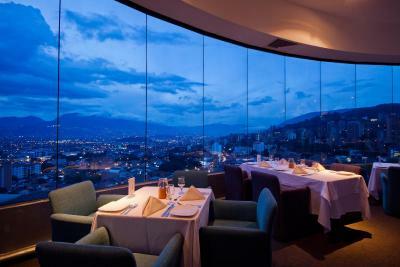 When would you like to stay at Hotel Dann Carlton Medellín? Features patio views, work desk, air conditioning, plasma TV, dining area, mini-bar, seating area with sofa bed and private bathroom. Free WiFi is available. Features patio views, air conditioning, work desk, plasma TV, safe, mini-bar and private bathroom with toiletries. It is fitted with a queen size bed. Free WiFi is available. Features patio views, safe, air conditioning, sofa bed, 2 plasma TVs and 2 private bathrooms with toiletries. It is fitted with a queen size bed. Free WiFi is available. Please inform the hotel if there will be children under 12 years old staying at the room previous to arrival. This room features patio views, a work desk, air conditioning and plasma TV. It has a dining area, mini-bar, seating area with sofa bed and private bathroom. Free WiFi is available. 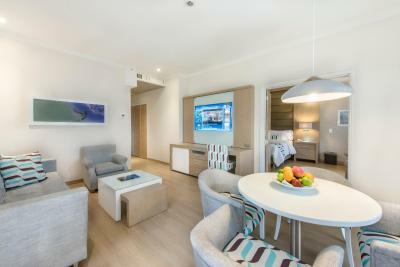 This room features a working desk, air conditioning and plasma flat-screen TV. It has a dining area, mini-bar, seating area with sofa bed and private bathroom. Free WiFi is available. House Rules Hotel Dann Carlton Medellín takes special requests – add in the next step! Hotel Dann Carlton Medellín accepts these cards and reserves the right to temporarily hold an amount prior to arrival. Please note that the airport shuttle service is upon arrangement. Please note that additional guests will need to pay an additional surcharge. The hotel will charge the guests credit card or deposit if there is an additional guest. My major issues involved security. 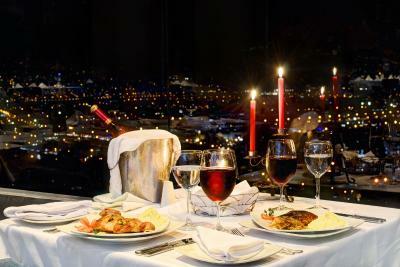 Someone charged a dinner at the rooftop restaurant to my room. Ruben at reception removed the charge from my bill after not finding any documents showing I had ever been there. It wasn’t a huge tab but It made me feel targeted. Guests are required to sign for all purchases in the hotel unless paying in cash so I don’t know how this could have happened without an employee being involved. In the future I will review my bill periodically for such fraudulent charges. Second, my credit card number was stolen and used after I had used the card in my room. I realized later that the WiFi in the rooms is not secure and that I should have used the WiFi in the lobby. These two issues were avoidable and I ultimately was not liable in either case. But I should always feel secure in my hotel. Instead, I felt a bit uneasy after these incidents. I hope the hotel can make adjustments to improve in this area. I will be much more vigilant also. Also - it’s minor but I just don’t understand the need for coffee servers at breakfast. I have to request coffee each time and instruct each server how I like it. Why not just have a self serve coffee station like other hotels to go with the self serve buffet. The servers were wonderful people but it seems carrying coffee from point A to point B is a waste of their skills. One more issue - I arranged for pick up service from the airport late at night and received the hotels acknowledgment through Booking.com. I wrote twice to confirm. Booking.com actually emailed me to make sure my hotel pickup was made. But I waited for almost an hour - no one showed up so I took a taxi. Indeed, reception had no record of the pickup arrangement. I like the Dann Carlton very much and I hope the hotel takes these comments constructively. Noise is very loud in hallways. People yelling, shouting, singing, etc. I didn't like that I could hear the couple in the neighboring room (there was a door between our rooms). Someone was on the phone loudly, and I felt like I could hear the whole conversation. Also, I was bothered during my dinner. I was told that I was not allowed to leave a tip on my card and that I had to tip in cash. Poor bedding, towels, cracked sink, ugly interiors, noisy adjacent room, no coffee, water, etc. Nice hotel in nice location, but getting little bit outdated. Very good breakfast, nice bedding, spacious rooms. If you are looking for a quiet place to have a good sleep, this is not your hotel. Friday and Saturday nights the hotel is packed of events like weddings and birthday parties and the music is super loud, so you can hear and feel the beat from your room. This has happened to me twice now. Short stay. I was not able to use the pool. 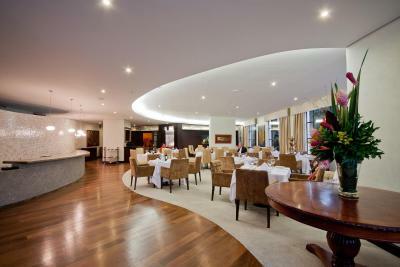 The restaurant and the facilities are very good. Live music at night. Not enough electric outlets in the room or night tables. Noisy air-conditioning system and the phones were old. The shower did not drain well. The printer in the business center was not working so I had to rely on the front desk which is not convenient and not the best arrangement for privacy of documents. Finally, there are no bathrooms in the lobby. You have to use the pool bathrooms away from the lobby.